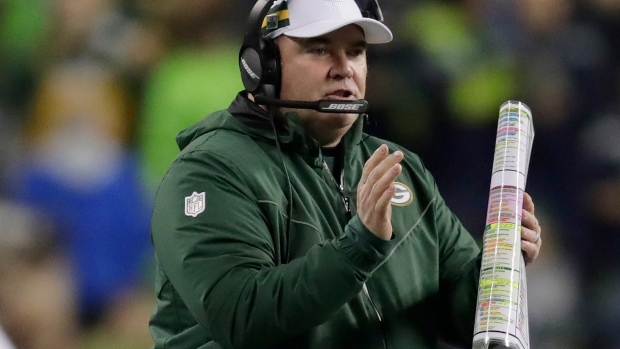 GREEN BAY, Wis. — Fired shortly after Sunday's loss to the Arizona Cardinals, former Green Bay Packers coach Mike McCarthy didn't get a chance to say goodbye to the team he coached for most of the past 13 seasons. "He held it together as much as you can," third-year defensive tackle Kenny Clark said on Thursday. "It was emotional. It was emotional for all of us. Mike came in, and we were surprised he was even coming in. Seeing him, gave him a round of applause and thanked him. He was emotional about it, we were all emotional about it." "I was happy to see him," Matthews said. "Obviously, first thing's first, you understand that this is a business and not many people get that opportunity. For him to invest the past 13 years in this team, has given his heart and soul to us, to have that kind of closure, it was great of the organization. "I know we really enjoyed it. I'm sure he did from a closure standpoint. Obviously, we gave him the respect he deserved and sending him off with some final words." The Packers enter Sunday's home game against the Atlanta Falcons having lost five of the past six games to tumble to 4-7-1. Sunday's loss to the Cardinals, who were only 2-9 at the time, sealed McCarthy's fate. Less than three hours after the game ended, the team announced McCarthy's firing. Wednesday's return provided some closure. "Mike came by the office, I think Tuesday we all saw him as a staff, which was great," Philbin said. "Then we talked, and he wanted an opportunity to speak with the team. I was 100 per cent, fully supportive of that, and he did a fantastic job talking to the team. "Not just about football and winning football games, but his passion. His passion for the game, his love for the players was clearly evident. I'm sure it was emotional for him and everybody in the room. It was awesome. I thought he did a great job." "It was great" to hear from McCarthy on Wednesday, receiver Randall Cobb said. "It was great that he had that opportunity. I think he's given a lot to this organization. "Unfortunately, that's a part of the business, not only for players but for coaches, for everyone. Changes happen. This is a business, at the end of the day. They made a business decision." Notes: Clark was the Packers' nominee for the Walter Payton Man of the Year Award, which recognizes one NFL player for outstanding community service activities off the field as well as excellence on the field. "I was really happy. I always try to help people out and I always try to give back. For the Packers and everybody to recognize it, it's cool." ... RG Byron Bell (knee) and RT Bryan Bulaga (knee) missed practice for the second consecutive day. LS Hunter Bradley (ankle), who was injured on Wednesday, did not practice, either.